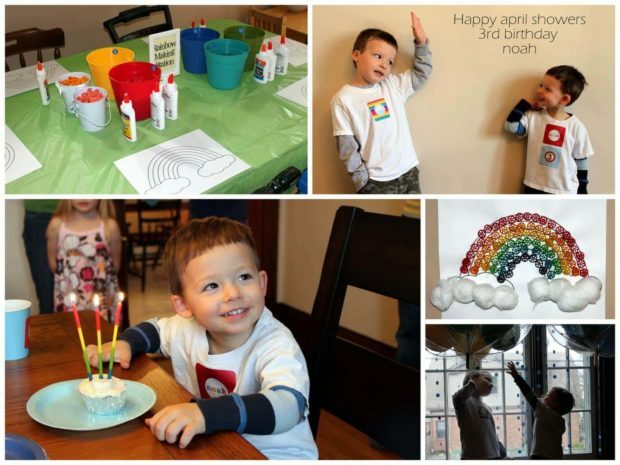 When the forecast calls for birthday showers, it makes total sense to plan a boy’s April Showers 3rd birthday party theme. 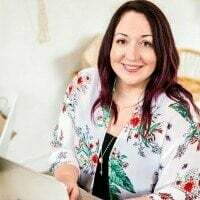 Shades of blue paired with rainbow accents produced one incredibly cute celebration, styled by the talented Jenny Dixon of Crossing the Bugger-Dixon Line. 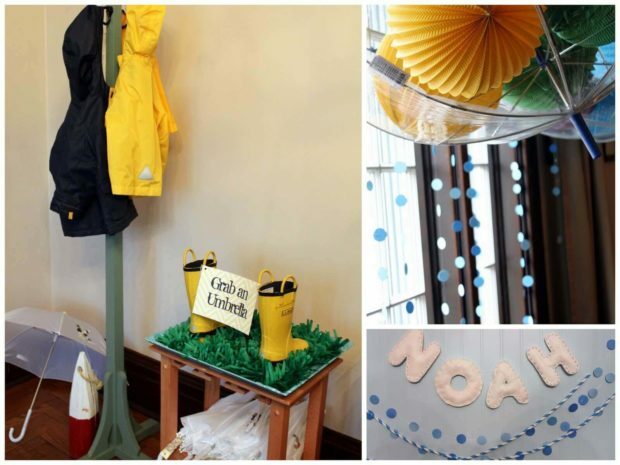 Just wait until you see all of the adorable cloud, umbrella, raindrop, rainbow and rain boot inspired decorations, treats and party games! 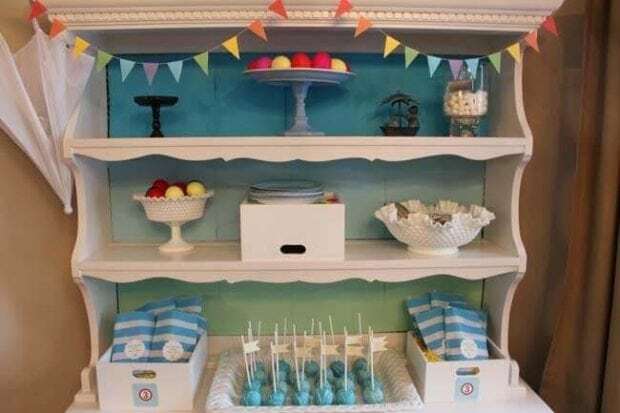 Get ready to bug out over the cool details of this boy’s bug themed 3rd birthday party. 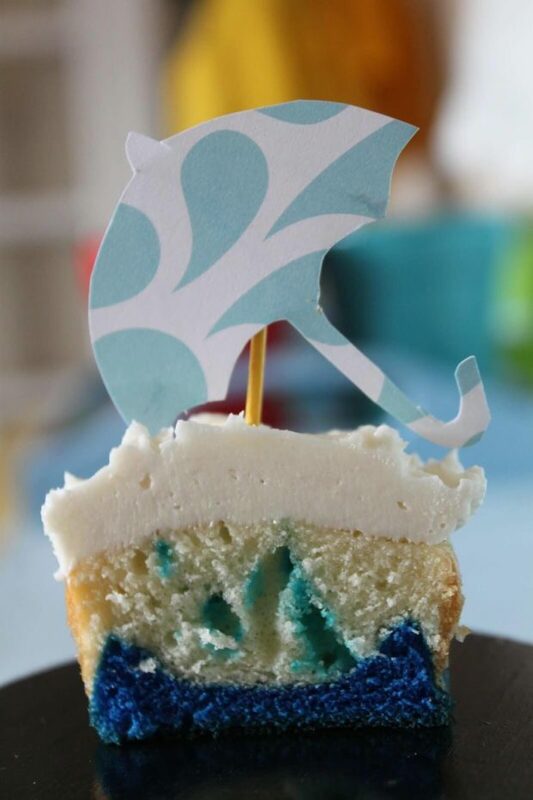 Jot down the recipe for a boy’s baking themed 3rd birthday party. A little rainy day vignette was styled near the entryway with a coat hanger for raincoats and a stash of umbrellas. How clever that Jenny used actual rain boots as props!? I am in awe of all of the darling handmade and super-stylish decorations and creative accents that make this party so festive and unique. Clear umbrellas hung from Jenny’s curtain rod, filled with tissue balls in all the colors of the rainbow. Paper circles were strung to look like raindrops from the sky. 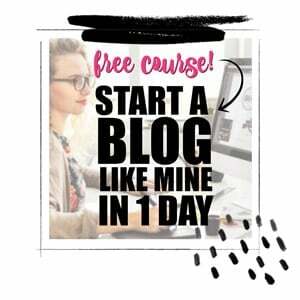 I love how such an inexpensive and simple DIY created such an impact. A rainy day celebration calls for plenty of treats. Jenny’s dessert table is just precious. 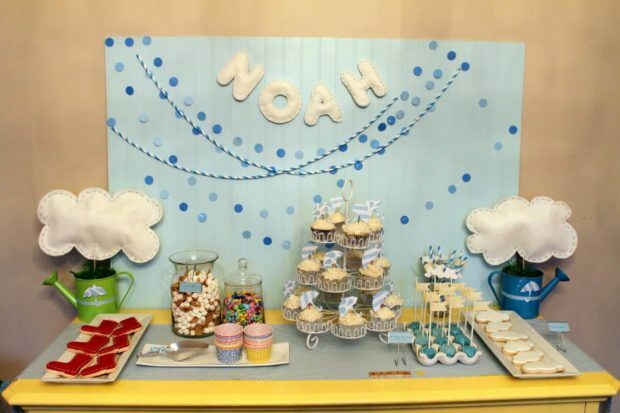 Bead board was painted a light shade of blue and accented with handmade garlands of paper raindrops. Her son’s name—Noah—was spelled out in hand-sewn, white, fluffy cloud-like letters. Watering cans were filled with artificial grass and “clouds.” The addition of ribbon and umbrella accents dressed up the watering cans. There were so many awesome desserts set on top of a cute polka dot runner. 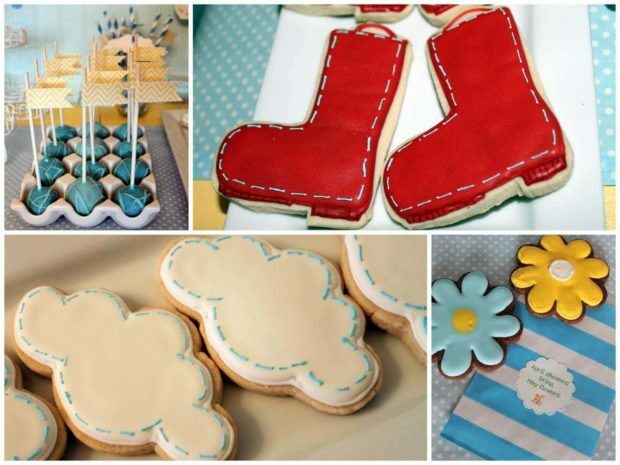 Sweet cookies were masterfully decorated to look like Wellies (adorable!) and clouds. Flower cookies definitely added to the yumminess factor! Jenny whipped up raindrop cake balls, sweetly displayed on a ceramic egg carton. A small s’mores bar was set up with jars of chocolate candies and a mixture of mini marshmallows and Honey Grahams. 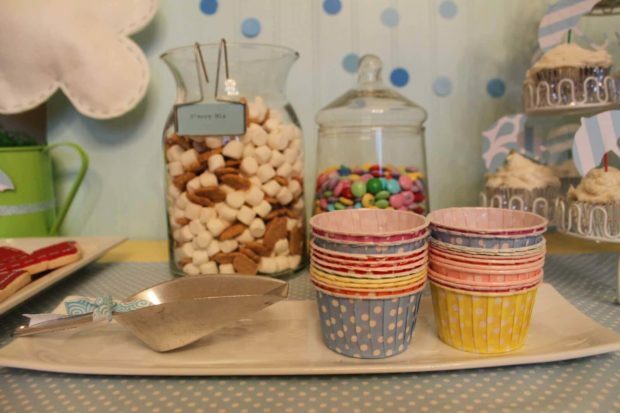 Candy cups were on hand so each guest could put together their own mix. And if the desserts weren’t already tempting and cute enough, rain puddle cupcakes (check out the inside-wow!) were topped with paper umbrellas and displayed on a three-tiered stand! 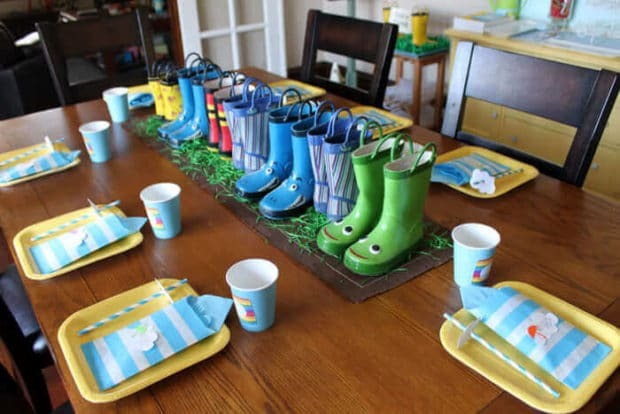 Kids dined at a table befitting the April showers theme. Faux grass was covered in pairs of rain boots and served as a creative table runner. Place settings were made up of yellow plates, accented with striped bags filled with napkins and utensils. Paper straws looked so cute with paper cloud toppers. 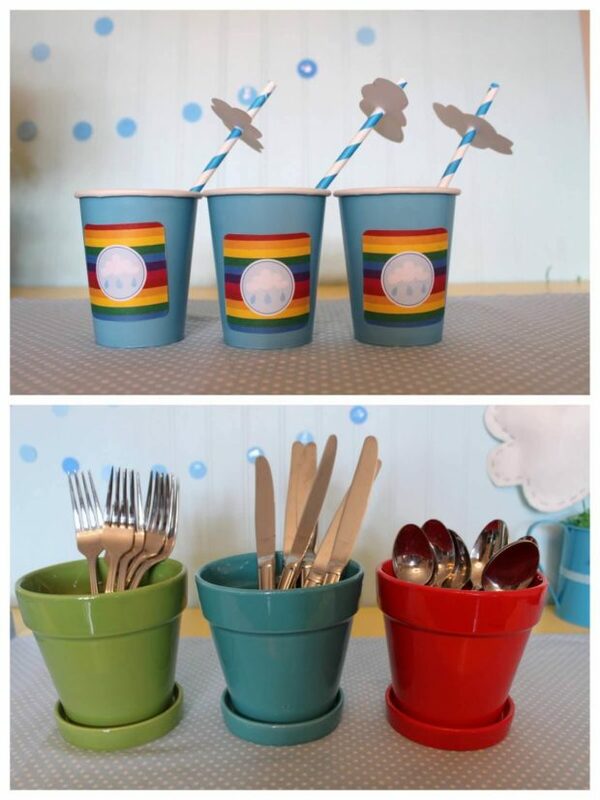 Paper cups were embellished with rainbow stickers. 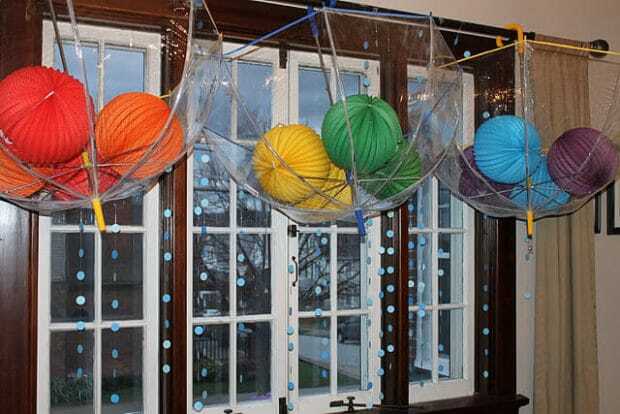 To keep guests entertained at the rainy-day party, Jenny planned a seriously fun activity: rainbow making. It was the perfect craft for three-year-olds, using cotton balls, rainbow colored pasta, glue and a printed coloring page. 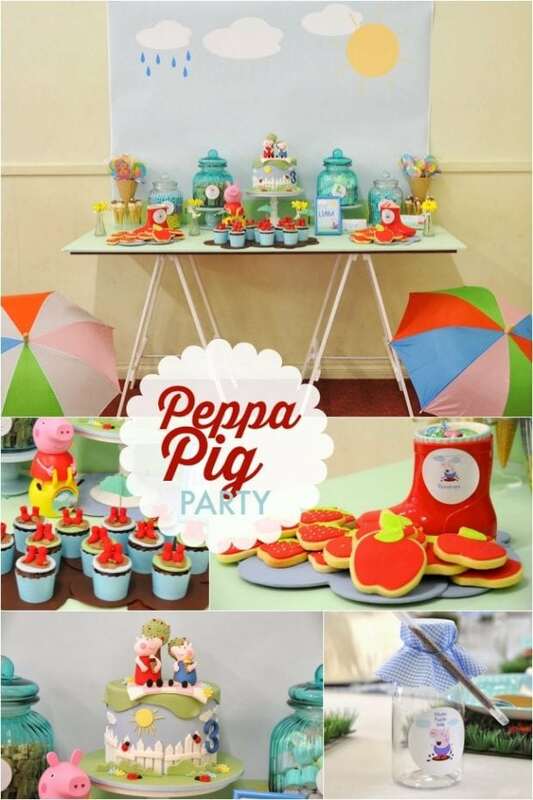 This would be the perfect party to hold some outdoor party games as well! 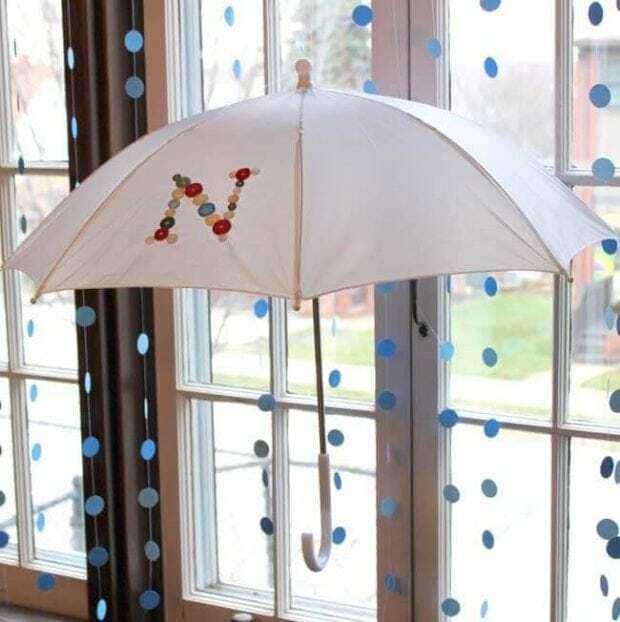 Guests at this party splish-splashed home with bags of flower cookies and button-monogrammed umbrellas. What perfect favors! Get on your raincoat and boots—it’s time to do some puddle jumping!